December was a rather regular month of spending for us, which might come as a surprise since Christmas happens in December after all. But here in Frugalwoods-land, Christmas and other such events are not an excuse to spend tons of money. As you’ll see in the below list of expenses, there’s a line item for shipping Christmas gifts because we enjoy sending gifts to our parents and siblings. This year, we were thrilled to mail out packages of entirely homemade products all sourced from our garden! Everyone received preserved pickles, beans, apple butter, and rhubarb compote, all grown on our land and canned in our kitchen. There were obviously costs associated with both the growing and the preserving end of things, but we were delighted to send out fully homemade gifts this year. I’m also a huge fan of consumable gifts because they don’t contribute to clutter, they’re meaningful, and everyone likes food! At least, I sure do! Since the birth of our second daughter is fast approaching (she’s due in mid-February), we opted to spend a quiet cozy Christmas at home with our little family of three (four if you count Frugal Hound), which was equal parts frugal and festive. Our main expenditures were on a few extra grocery items to make special Christmas dishes–our customary breakfast casserole, shoo fly pie, and chicken spiedini menu, the recipes for which I shared last year. We also went out for a rare treat lunch at a restaurant during the Christmas week as Babywoods is decidedly more delightful during the lunch hour than the dinner hour… no reason to struggle through a restaurant meal with an exhausted toddler! There’s a BBQ place not too far from us that offers a free salad bar meal for kids under four, which suits Babywoods perfectly as: 1) they have chicken and eggs on their salad bar, two of her favorites, 2) she gets to eat immediately, which alleviates the interminable (to a toddler) wait for food to come to the table, and 3) free meal for the kid! Ideal. Not a euphemism, I bought me some curtains. Try not to faint. Indeed, you might be surprised to see that I bought not one, not two, but THREE BRAND NEW blackout curtains for the three windows that grace Babywoods’ and her little sister’s bedrooms. People, it is RARE that I buy things and even RARER that I buy things new. But I did this time. Let me tell you all about this thrilling tale. Two years ago, prior to the birth of our first daughter–known to you all as Babywoods–I read that babies sleep best in dark rooms. Ok, I thought, I will make her room dark. Easy! I taped paper bags over both windows in her room and presto: frugal and free blackout curtains. 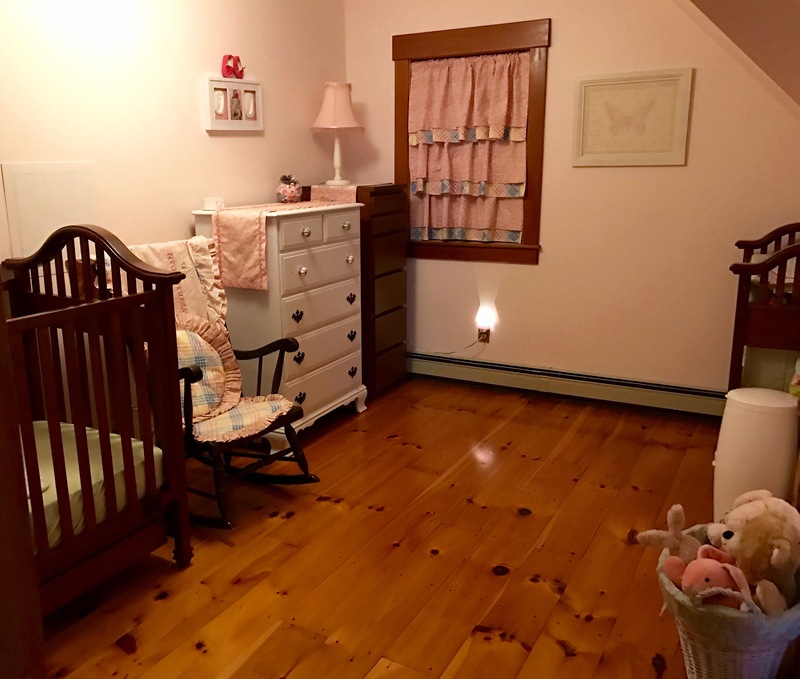 Then, we moved to a new home–aka our homestead in the Vermont woods–and I enacted the exact same methodology in her new bedroom. Paper bags taped up to completely cover her window. I then hung cute hand-me-down curtains (which are in no way, shape, or form blackout curtains) on the window to cover up the paper bag situation. However. I did not realize that I’d made a terrible miscalculation vis-à-vis my new windows. You see, the windows in our Vermont home are made of–you will not be surprised by this–wood. And wood, as it turns out, is not amenable to being constrained by paper bags. Wood wants to breathe. It does not want tape covering its woody bits. Like an idiot, I did not realize this. Lo, quite a few months later, I happened to peek behind the paper bags and was confronted with growing mold. Ick. And so, my cheap paper bag hack had to go. I first tried to meet this need by implementing a supremely frugal tactic: paper bags over the windows. When this failed, I got out my box of old curtains and tested them for their light-blocking capabilities. None of them were designed to block out light and all proved pretty miserable at the task. Then I considered whether or not I actually need blackout curtains for my children’s rooms. I determined that I DO need blackout curtains because my child sleeps fabulously (knock on wood) in a dark room and it’s not worth it to me to mess with a baby’s sleep. Fellow parents know that we will do ANYTHING to get our kids to sleep and if blackout curtains work? You don’t mess with a good thing. Next I considered if this was an item I could borrow from a friend. Nope because it’s something I’m going to need for a long time. With stuff that we only need for a single project or a brief period of time (such as a specific tool), borrowing is a fabulous frugal tactic. But for curtains? Not so much. Next I tried to find the curtains used. Buying used is vastly cheaper than buying new and it’s also a great way to shop environmentally. New products incur a high carbon footprint and buying used circumvents both these embodied costs and also keeps a used item out of a landfill. I scoured thrift stores, Craigslist, and my online parent swap groups. No luck. After exhausting all of these strategies, I resorted to my very last resort: I bought them new. In order to find a good deal, I checked a few local stores and compared prices on Amazon. The cheapest, best curtains I could find were these from Amazon and I’m pleased to report they’re working out quite well indeed. By following this regimen before buying new, I’m able to avoid buyer’s remorse, know that I’m spending in alignment with my values, and feel confident about this outlay of cash. When purchases are intentional and well considered, there’s no reason to feel any guilt and they’re a great illustration of living a fully frugalized lifestyle. I really did! And I’m so excited! 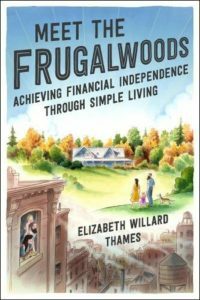 As I shared last month, my book, Meet The Frugalwoods: Achieving Financial Independence Through Simple Living, publishes on March 6, 2018 and is available to be pre-ordered now. If you do pre-order the book, I will mail you a signed bookplate! You’ll notice a line item below for stamps for said bookplates because I’ve already mailed out the first few batches! But if you too would like to have my signature arrive in your mailbox, there’s still plenty of time to place your order. You can find all of the details here. Home insurance for Vermont property $637.00 One full year of home insurance on our Vermont home. Preschool $180.00 Babywoods goes to a Waldorf preschool two mornings a week, which she loves and we love! Household supplies $115.78 All non-food household items, including such thrilling things as toilet paper, laundry detergent, and toothpaste. Woohoo! Internet $74.00 Love that we have high-speed Fiber internet out here in the middle of nowhere. An expense I’m very happy to pay! Restaurant dinner for date night $63.34 Our fabulous neighbor comes over to watch Babywoods one night a month so that Mr. FW and I can go out on a date. We have the best neighbors in the world!!!! Three blackout curtains for the girls’ rooms $50.97 Here are the curtains I ended up buying. Stamps for mailing out signed bookplates for my book $42.50 Stamps for mailing out signed bookplates to Frugalwoods readers who pre-ordered my book. Chainsaw gas can $38.25 A new gas can for the chainsaw. Restaurant family lunch $37.00 The three of us went out for a special treat lunch during the Christmas week. Yum! Curry paste $7.87 Mr. FW made a divine green thai curry dish for us this month and needed this curry paste, which he couldn’t find at our local asian market. Amazon to the rescue! Happy New Year! I am excited to read your book in a few months! Awesome! Glad to hear they’ve held up for so long. And so true about long days–in the summer I swear it’s light until 9pm!!! The baby will be a Valentine’s baby?! How exciting!!! And it looks like BabyWoods1 is ready to help out with her sister. So sweet. I just hope frugal hound appreciates getting an early copy… 🙂 we just got our bookplate in the mail! Looking forward to reading in March. So glad your bookplate arrived! 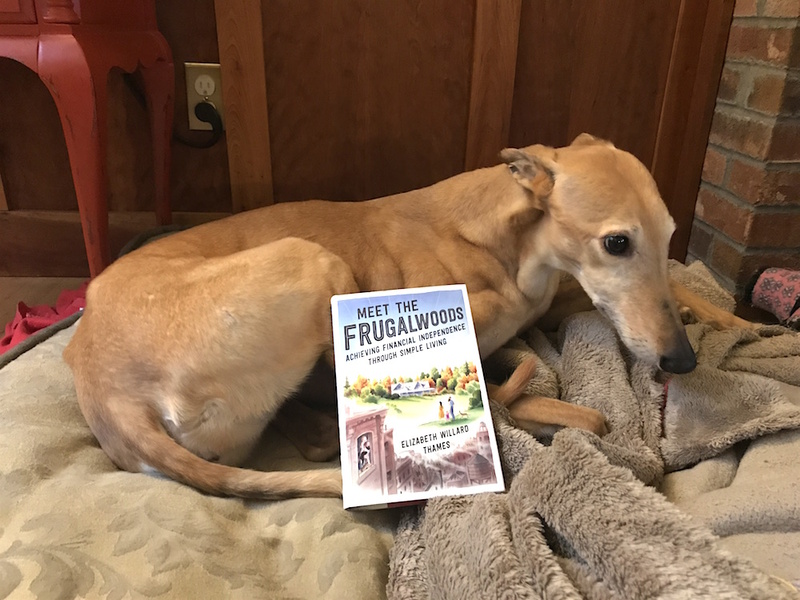 And, would you believe it, Frugal Hound hasn’t even read her copy yet… that dog. Oh gosh, the feels for having to buy new things. I am finding it increasingly difficult to do! We spent 6 months with a dustpan and broom until we were gifted a used vacuum cleaner for Christmas. Curry paste is really good! We love the green one, it gives so much more flavour compared to curry powder. 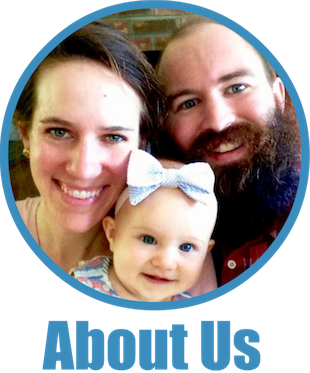 I really like the “simplified, non-consumer-focused style that emphasizes time spent together as a family”. On Christmas, I cooked a turkey, chicken soup, and some side dishes, and enjoyed it with my family and a friend. After Christmas, I went to Michigan and visited my college friends there. We had a great time together. I absolutely love giving homemade gifts, but I’ve never really used my garden to create those (I’m more of a crafter). But I think I’ll try to add that to the rotation next year! I love getting consumables instead of stuff at the holidays. P.S. I was so excited to receive my bookplate! Congrats on a frugal Christmas! Holy moly that insurance! I pay $450 for flood and $2500 for HO for a very modest home – and I have shopped around extensively and don’t think a better price exists. Sometimes it’s a good reality check for me that geography and frugality have links. I will not live a Louisiana summer without AC, for example. I would absolutely love to receive homemade farm goodies as a Christmas present! So thoughtful. Gifts that contribute to clutter stress me out. We opted for more consumable gifts this year because of the amount of clutter people (including us) seem to have. It does become stressful, and giving and receiving consumables and homemade items solves that. Plus, it is delicious! For my side, we don’t do gifts between adults. So it took a little getting used to doing the whole gift thing again when I got married. Don’t get me wrong, I love gifting. It’s been more ad-hoc for a long time though. Bringing back something I come across from a trip or stumbling on something I think someone will love. Having said that, I’m with you on loving food gifts! When I visit the in-laws further north, we bring up a food basket of some of their favourite eats or novelty items. Being in the city, we have easy access to things they don’t so it makes for a great gift. Oh wow I didn’t know baby #2 is a girl! That’s so exciting! Your expenses in December look amazing! Our food expenses in Dec alone was already $1,350. We went on a four day trip and ate out most of the time. Happy New Year! black out curtains are, to my mind, as the mother of 3 champion-sleeper children, an absolute necessity. They just are! Sleeping and eating are the two cornerstones of what can either make a happy, tranquil home or one that is… less tranquil for a while. All new babies obviously and quite necessarily do wake up during the night for feeding, and that is as it should be, but that gets old, quite quickly and the sooner they can sleep peacefully and deeply (within reason), the better for everyone. Same with food. A child who is desperately picky or weird about food can actually overshadow a lot. Whether it be texture sensitivity or just pandered-to brattiness, it is awful to have a child who eats from a vanishingly small list of foods. Here’s to babywoods 2 being an excellent sleeper and a great eater! Yes, yes, and yes!!!! Sleeping and eating are what it’s all about! I beat myself up a bit buying black out curtains too. Mine didn’t look like yours though. Yours are adorable and shorter. We have huge windows that needed the jumbo blackouts and the ones we got were on the cheaper side because it was an huge blackout sale at Kohls. I don’t regret them – they work! But I felt bad to buy something new or not finding material to make it ourselves. Our Christmas month earnings tend to be lower and spending higher – for us it’s because of family, not stuff, so zero regrets about that. That photo of Babywoods talking to belly makes my heart melt!!! Precious! I’m glad you bought blackout curtains that are also thermally insulated. Even with good double or triple pane windows, when you’re enjoying that polar vortex, a little more insulation is a good thing! So you’re also investing in keeping your home temp regulated…they are good for the summer too, when it’s super hot. What credit cards do you use? I have been looking at all of those different websites and I still can’t decide what would be best? I appreciate your help! Thanks! That’s clearly going to depend on your families needs, your own credit history and your purchases! I have a boring one from my bank that gives 1% cash back on everything, 2% groceries and 3% gas, and I’ve recently got a shinny new Delta/ American express that racks up air-points with each purchase. If your family doesn’t fly, or only goes places Delta doesn’t then this clearly isn’t going to be the card for you! I’ve heard good things about Chase’s CCs too. I know you aren’t a huge crafter, but curtains and window shades are a super easy DIY (even for someone like me who doesn’t sew)! Fabric stores sell black out fabric. I made nice fabric roman shades with fabric, and iron hem tape. Just an hour with an iron, and I had custom looking shades that fit my needs about $8 a window – people still comment on them and have no idea they were a cheap diy project (there are tons of no sew roman shades tutorials online). Oh Heidi, you don’t even know the depths of my hatred of crafts… it’s pretty deep ;)!!! My dear mom actually made up those other curtains for Babywoods’ room because I just wouldn’t do it. So, suffice it to say, I was very happy to pay for these curtains!!! I should, however, get a sewing machine and up my game… someday maybe ;). I agree with Heidi that making your own blackout curtains is extremely easy to do, but I too hate crafts. I’d rather get a root canal without an anesthetic than do crafts. I wish we’d started with a dark room for our daughter. She slept with a light on and a sleep mask until she was 12. The logic of the situation couldn’t sway her. She just had to get past it. Our December was expensive. We have not mastered the Frugalwoods method for gift giving and have an extended family. Add that to the contractors at the Oldsters’ recently purchased house and it was, well, a lot. Hoping for better in January. $38.25 might seem like a lot for a chainsaw gas can, but that is a very nice gas can. When I need a new one that’s the one I’ll get. It is so annoying that all the other cans with supposedly “spill-proof/leak-proof” spouts are anything but and they usually break shortly after getting them home. The separate chambers for gas and bar oil is genius and the on-board tool storage is also a nice touch. Mrs. Frugalwoods, did you know you can buy stamps on eBay for less than face value? Mr. MLM’s father was a stamp guy and we inherited bags and bags of non-collectible stamps. We’ve used them regularly for two years, and we probably have several years to go. This is despite Mr. MLM sending out letters on a daily basis for his eBay store! I like them because they are fun. Our Christmas cards went out with an assortment of Christmas stamps, some that were older than I am. However, some people inherit these bags of stamps and don’t feel like sorting through them to make correct postage. So they put them on eBay for a reduced price! Mr. MLM plans to buy our stamps this way once our current supply runs out. Also, if you have an Amex card, keep an eye out for merchants included in “Amex offers” who sell stamps. Boxed.com comes to mind. Also, unrelated – I’ve used the Boxed Amex offer to purchase Quaker oats quite cheaply. Most items are over-priced, but once you deduct the Amex rebate, the price can be great on certain items. How are people able to sell stamps for less than face value? Aren’t they losing money? They are. But some people just want to go to a book of stamps, pull out one, and be done with it. They don’t want to hunt for the correct amount of postage and do math. So they sell them on eBay. We ended up using tinfoil over our first child’s windows to block out all light. It worked well! Now we have Plantation shutters which work well also. Growing up in New England we always had condensate on the windows though, and I can see where that could lead to mold if hemmed in by a bag or foil. December was fairly expensive for us (prepaying for trips for next year, life insurance is due, etc. ), but January is shaping up to be great because we paid off our mortgage in full yesterday 🙂 I won’t miss that bill every month! You ever consider switching to MintSIM for cell service? I believe they’re a T-mobile MVNO, but don’t quote me on that. It’s $15/month (a bit more with taxes/fees, but still less than $16), for unlimited talk, text, and data. With the $15 plan, data is throttled after the first 2 GB. They do make you pay for the whole 12 months at once, though. You have to have your own, compatible, unlocked device, though. You can check it on their website. We use BOOM solely because it’s the only MVNO that gets service out here in the middle of the woods. Mr. FW valiantly tried every single MVNO in order to land on BOOM. So, while they’re not the dirt cheapest, they’re the ones that work where we live! And so much cheaper than a regular provider. Oh, ok. Well, that’s fair enough. Haha. And I know T-mobile isn’t the best in a lot of areas. do you know what network BOOM uses? If it’s Verizon, US Mobile also offers an MVNO over Verizon network. They have good options too that might be comparable and/or better to BOOM. But I second MintSim. If T-Mobile gets more towers in your area (it happens in rural areas, you’d be surprised), re-look into getting Mint Sim. Currently I pay $20 a month for 5GB data and unlimited talk and text, plus if you have an Android phone, you get wi-fi calling for when you’re in an area with poor cell reception (so long as you’re on a wi-fi network). You just have to prepay 12 months at a time for that rate, so its $240 once a year. We live far from family so our holidays tend to just be myself, my husband, and our 2 kids. Because we emphasize time together as a family so much anyway, and homemade food from scratch is the norm, I find it hard to make holidays feel particularly special without some extra spending. We have solved this in the past by creating new traditions (like turkey sandwiches and a hike on Thanksgiving rather than the big family dinner), but I am curious if other people feel this way and what they do about it? What about special music or specific games? Or rewatching a favorite movie only on the holiday? Silly question, but I’m dying to know where are the line items of small, random things – i.e. if you bought something on the used market or from a yard sale, or forgot to pick up any random thing and ran to the store, or amazon – like batteries… where are these items, are they all lumped together under household items? I guess I would be interested to see those items split up. Also, I have a toddler and wondering if you’re still getting the little one’s clothes all used? They’re so cute! Thanks! Yes indeed, the random items of life are lumped under “household” as are the garage sale finds! I try to highlight interesting things separately, such as the curtains this month. Most of the household items are super boring I promise. And yes, we get all of Babywoods’ clothes used–mostly as hand-me-downs. She has two girl cousins just a few years older who supply her with a great wardrobe as well as a few local families with older girls who kindly hand items down to us. And, my fabulous mother-in-law likes to send her fancy clothes periodically. I also scour garage sales for her (especially for winter gear) and frequent kids’ clothing swaps several times a year (I stock a bag of baby clothes to donate/exchange for this purpose 🙂 ). I will say that not all of her clothes are cute or hole-free or stain-free, but they work perfectly fine for us and we’re very glad not to have to buy her clothing! I always wondered where the garage sale items went in the budget! Now we know. Yes! If I were more organized, they would be separate, but since each item is usually less than $5 (and paid for with cash), I just haven’t done it. I should someday though! I’ll add that for specific reference, the red Christmas dress she’s wearing in the above photo was a hand-me-down from a friend of mine in Boston and the polka dot dress she’s wearing in the top photo came from a free clothing swap :). Both were too big this year, but we made them work and I’m looking forward to reusing them next year :)! 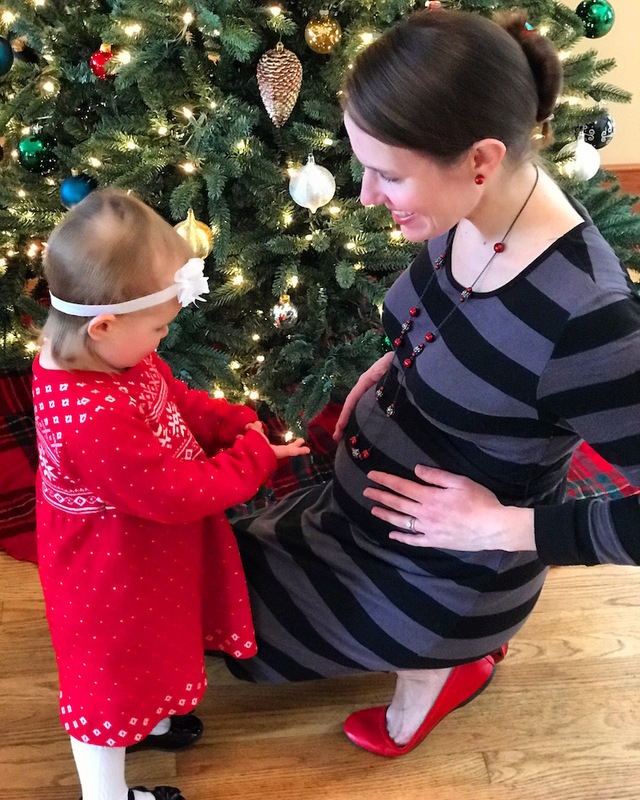 No Xmas gifts for Babywoods #1? This post outlines our complete gift giving strategy and thought process: Reader Suggestions Of Frugal, Fun, Inexpensive, and Festive Holiday Gifts. Hope that helps :)! I love how you broke out curry paste as a separate item! I should probably do that with red meat to see how much I’m actually spending on steaks. As I mentioned in the post, we pay for things like car insurance in a lump sum the month it comes due as opposed to spreading payments out over months at a time. 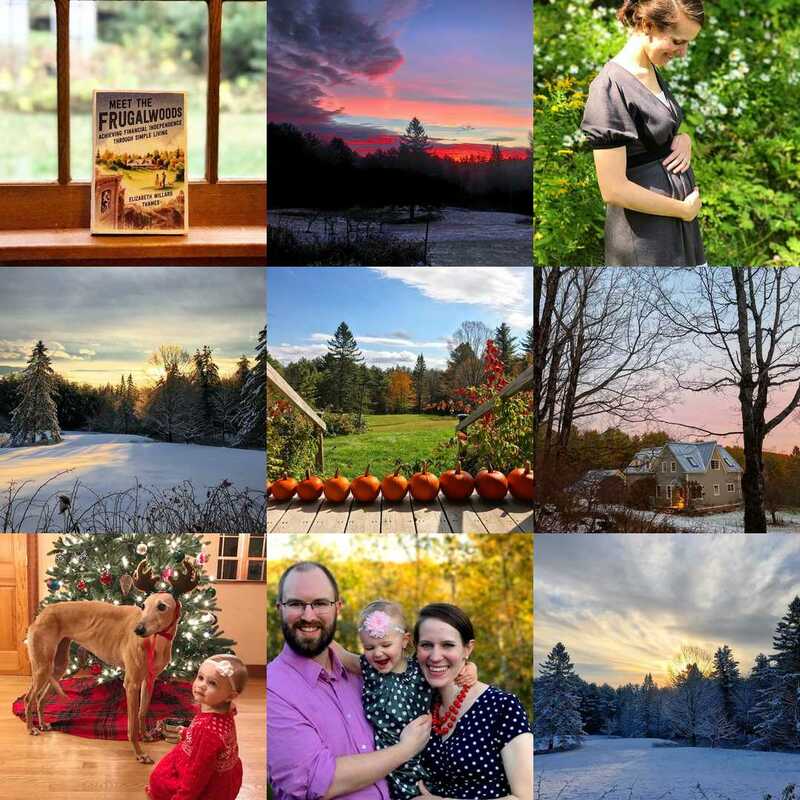 So, for example, this month you see the full year’s payment for the insurance on our Vermont home. You can check out our past expense reports (I do them every month) for the lump sum payments for things like car insurance. Hope this helps :)! Just curious….you live on 66 acres of trees, but is your Christmas tree live or fake? We switched to fake many years ago, but I do miss the smell of a live tree. I forgot to mention I have pre-ordered your book through Amazon and can’t wait to read it. Best wishes with delivery of second Babywoods. I know you hate buying new. I have a toddler, but we have no relatives, friends who have kids around her age so we don’t have any hand me downs. The Goodwills around us charge about $6.00 for a used toy. I have found it’s a lot cheaper for me to buy new at extreme discounts vs. buying most stuff at used clothes/toys stores. Garage sales are a little better but by the time you drive around and waste gas and find nothing it’s very frustrating. What are your thoughts on buying new but only extremely discounted ? My Frugal hack for not buying blackout curtains was hanging heavily blanket (previous owners had two little girls so the house pre baby proofed and had the brackets for curtains). I hope babywoods one is enjoying preschool! My daughter would go to preschool every day of the week if she could. Every day she asked me if school is open. Blackout curtains are an expense you’ll never regret! We actually have some (homemade, meaning they weren’t meant to be blackouts, they just are dark and thick) blackout curtains in the master bedroom because we face the East and it’s a pretty strong sun in the morning especially in Spring, Summer and Fall. Question from a Canadian: is Personal Capital available to Canadians? 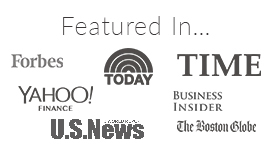 What about the list to find the best credit cards? The mortgage is included in the total amount spent and then I subtract it out at the bottom, just to show people how much we spent on all non-mortgage related items. Just another way of parsing out expenses. Hope this helps :)! 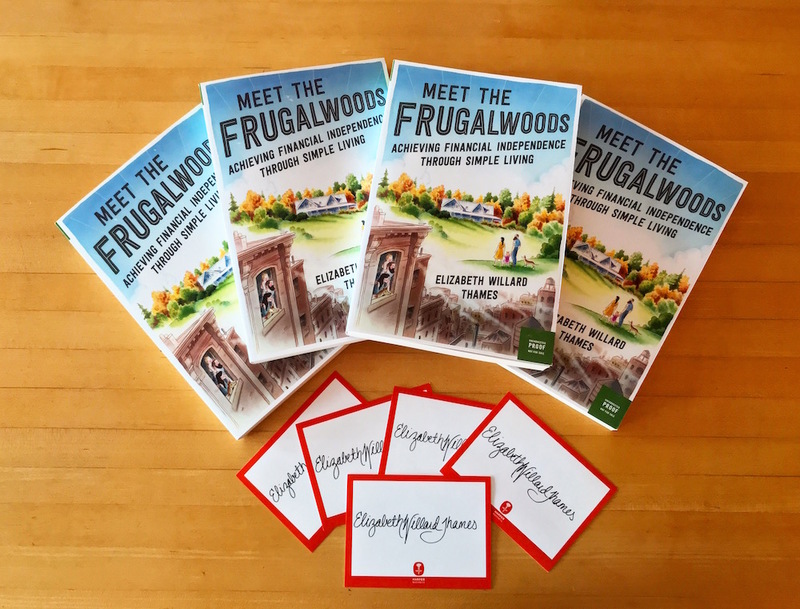 Thank you Frugalwoods for your webpage which I discovered after reading an article about you in the online newspaper The Guardian. 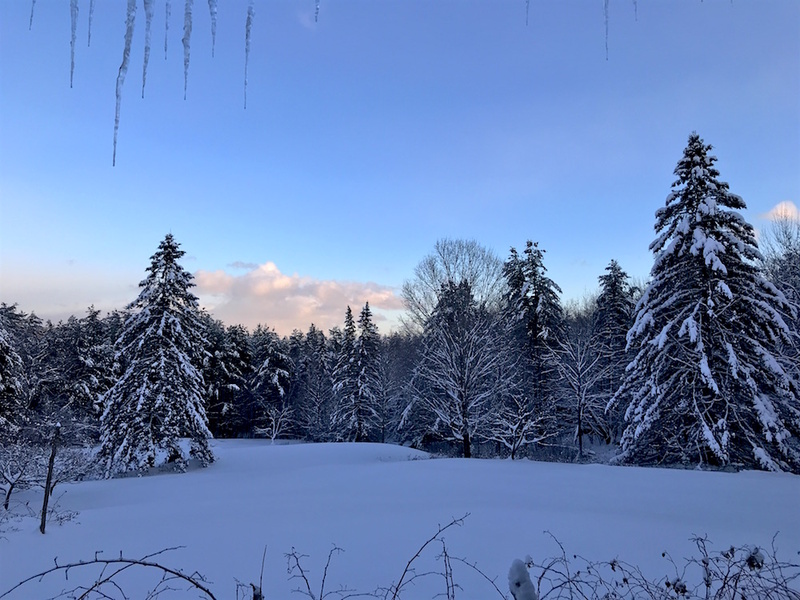 Though many there in the Guardian comments were skeptical, especially about the large amount of land which you owned, I did a little checking on Vermont land and found 122 acres for $155,000, so I understand well that with discipline and frugality, it is possible. I had my own drywall business for about 25 years and likely could have retired a little earlier, if I wished. I then put that money into rental properties starting in the mid 1980s, it has taken real fiscal discipline but with patience and not attempting to hurry things along (and the very challenging 2009 recession!) I have managed to hang in there and live comfortably, though not to excess. How many gb of data do you get on that $20 a month phone plan? It’s 500 megabytes per month, but I rarely use data. I mostly use WiFi so that I’m not using data.